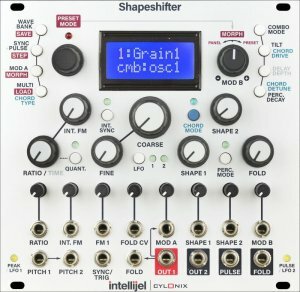 Cylonix and Intellijel have collaborated to bring you a very sophisticated and deeply complex Wavetable VCO. At the core of this module is very powerful FPGA board that he has pushed to the absolute max of its capabilities and crammed full of features. 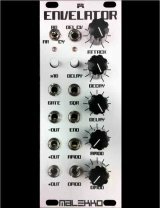 We wanted to create a module that really worked well in the modular context so there are a lot of modulation and control possibilities. Each VCO can select from 128 banks of wavetables , each with 8 individual 512-sample waveforms for a total of 1024 waves. The choice of waveform within the currently selected bank is under voltage control. There is smooth interpolation between the waveforms within a bank, allowing a very wide range of different possible waveshapes. Corrected logic out state (inverted in previous version). Added: 4 new MODA destinations, swapping Osc2 by Osc1 in the Phase, Combo, and Shape destinations, and swapping the Carrier and Modulator in the vocoder. 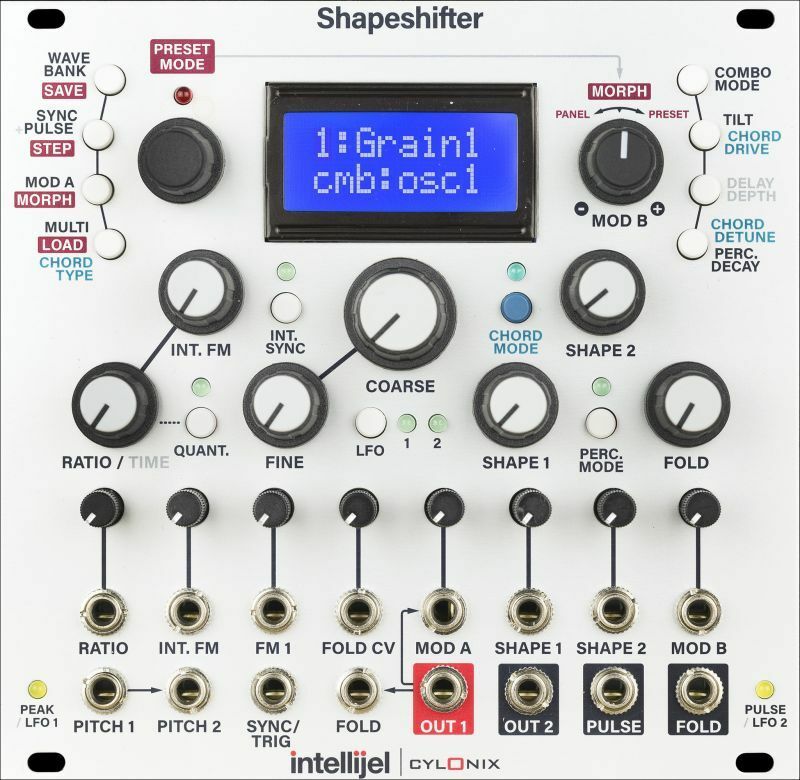 Changed: The modulation range for the Phase modulation (by MODA) and the Tilt function (internal self-phase modulation of Osc1) has been increased 4-fold. Fixed: In version 1.01 and version 1.02 the Shape1 and Shape2 parameters were coarsely quantized when Morphing between panel and preset settings in Preset Morph mode. The Shape parameters now smoothly morph between settings. Fixed: The pitch of oscillator 2 increased when changing the Multi mode with QUANT turned on. The pitch now remains constant over all multi modes. Added: Users can now choose between just intonation or equal temperament tunings in chord mode. Added: Holdsync mode has been changed to do holdsync for osc1 and oneshot for osc2. Added: A confirmation message is now displayed when a preset is loaded. Added: The version number of the firmware is now displayed when entering the SplashScreen display. Fixed: In version 1.00 there were small discontinuities in the waveforms when the Shape1 and Shape2 parameters were rapidly modulated. These have been eliminated.